As a medical student I used VINDICATE to build my differential diagnoses, both in third and fourth year. As an intern I’ve realized I should have moved beyond the mnemonic in fourth year, to be better prepared for working on the floor. Benefit from my mistake, and let’s explore how to think outside the algorithm. Third years will be best served by becoming adept at using the VINDICATE mnemonic before leaping into this post. Fourth years should start with the system method, and after mastery move on to the BALM method and OME Intern Guide’s “methods” section. Mnemonics let you quickly sort through etiologies to build a long differential. However, thinking head to foot by system pushes you to consider causes relevant to the patient in front of you. 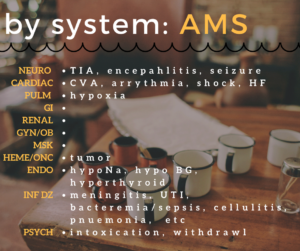 This method can seem more difficult to do on the fly, and you have to push yourself to think through each system for each symptom your patient has. I really wish I’d worked on this more as a fourth year med student, when I had the luxury of thinking in detail about my 1-2 patients. Now I’m struggling to think through system for anywhere from 4-10 problems per patient, and even on a light day doing that for each patient before rounds is mentally exhausting. Start building this skill now, not later. I found a family med doc’s slideshare on generation of DDx, and his last four slides are golden. One that stands out is considering a differential based on discipline. For example, in psych your differential needs to include drug abuse/dependence, while in geriatrics you have to consider falls. It’s a very different system of thinking, but may help narrow a wider differential you’ve built. I think this would be most helpful the first few days of starting a new rotation, trying to get into the mindset of, say, pediatrics after a month of geriatrics or OB. Another part of Dr. Pong’s slideshare, his BALM mnemonic is a synthesized method, incorporating different thought processes together. Using the systems structure in conjunction with consideration of each issue’s chronicity and extent makes you think beyond a mere mnemonic. He also poses important questions, such as what is most likely, and whether or not each a potential differential problem needs to be higher simply because it might kill your patient. See the resources below to check out his slideshare. This book has differentials built for a variety of common issues that moves beyond all this, incorporating BALM and more. While I feel it’s useful to review prior to running down to do an H&P I keep discovering that the chief complaint is rarely the most pressing concern, so keep it in your coat pocket and refer to it often. If you have this during your sub-I month I think you may be better able to push yourself to learn more, and be better prepared for the intern year to come. As an intern myself, I often feel I have little to no time to reference a book at all. What I’ve written here is just scratching the surface, as I’m working to further develop my skills as a physician. If you feel ready to move even further, check out the resources listed below. They range from being meant for students, to residents, to beyond. Check them out, find out which methods make sense to use and learn from them. All knowledge is worth having. First Aid’s discussion of VINDICATE’s mnemonic, and Pixie’s recent version.